Our Headstart days are the ideal choice for anyone looking to improve their study skills before starting life as an LSBU undergraduate. They consist of presentations on a wide range of topics, and have been designed to help you know what to expect when you start your course. 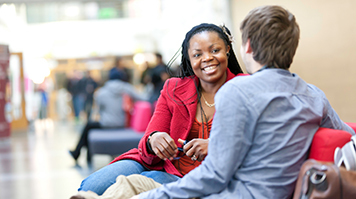 If you have accepted an offer from LSBU (firm or insurance) then our Headstart days can help you hit the ground running. You'll register along with your future course mates and have a little time to share a tea or coffee with some of the students you will be studying alongside for the next three years – an ideal opportunity to get to know a few names and perhaps make some new friends. The Head of Department or a senior member of staff will welcome you and your fellow students to LSBU, and give you an oversight of the department that you will be studying in. Starting life at university might seem daunting, but there are lots of people here to help you settle in as quickly as possible. This talk will focus on the enrolment process so that you know what you will need to bring with you, and what is expected of you, so that you can be well prepared and complete your enrolment quickly and easily when the time comes. The contents of this talk will vary greatly depending on your chosen subject, of course, but it will discuss what you can expect to be doing as part of your degree. If you still have any questions about what and how you will be learning, or the ways you will be assessed, then they'll be answered here. These talks will be taken by a academics responsible for delivering modules on the degree and will offer real insights that can help you to get your LSBU education off to the best possible start. You'll take part in a detailed tour of the learning facilities relevant to your course. This will take in the equipment you will be learning to use as well as libraries and learning spaces. You'll also have the chance to meet current students to hear what they think of the course, and ask any questions you may have.